In honour of Louis Vuitton’s beautiful SS17 collection, which showed at Paris Fashion Week today, we’ve charted the greatest ever Louis Vuitton fashion shows. Current creative director Nicolas Ghesquière’s future-ready take on fashion is taking shape quite nicely at the French fashion house. He’s opened the brand’s first museum, created an LV psychedelic time warp for SS15 and is generally doing a really good job of putting his own stamp on the iconic label, while introducing plenty of his own new tricks. And let’s not forget that Nicolas had big shoes to fill – Marc Jacobs was appointed creative director back in 1998 and delivered Louis Vuitton’s first-ever ready-to-wear collection that spring. Charged with turning the heritage luggage label into a global fashion powerhouse, he upped the ante season after season with each show-stopping set more spectacular than the last. When his time was up in 2013, he certainly wasn’t going to go quietly (you’ll soon see). 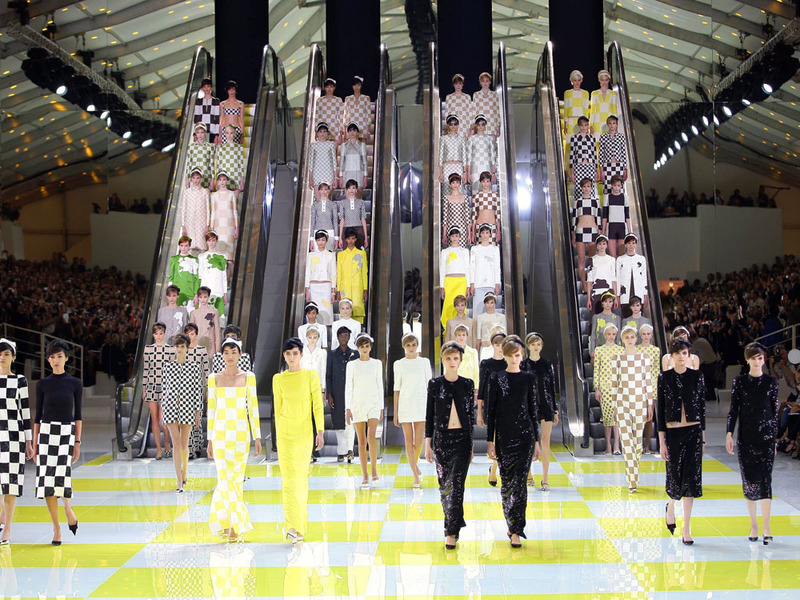 From SS12’s pastel-hued carousel to that time Marc Jacobs built an actual steam train to complement AW12’s passenger attire, we’ve picked the most memorable Louis Vuitton fashion shows ever. 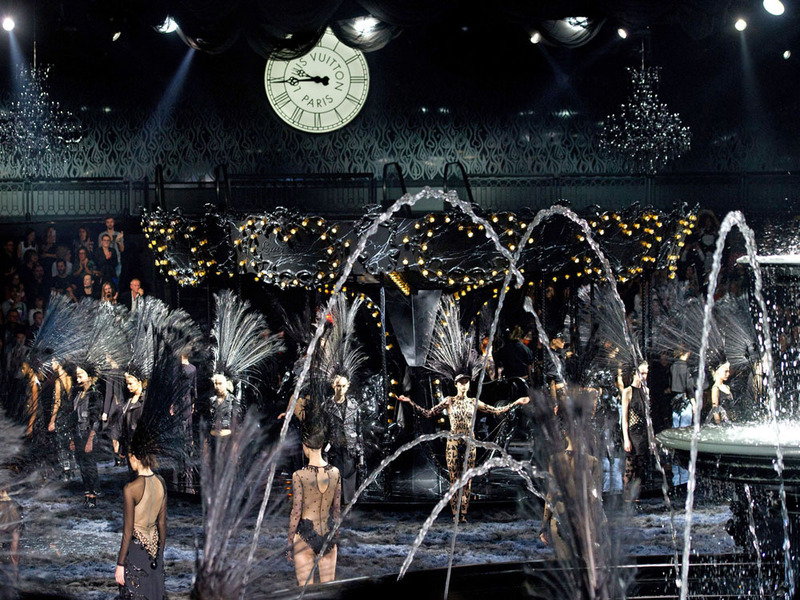 Let’s kick off with one of the prettiest fashion shows we think we’ve ever seen. Marc Jacobs borrowed a full-scale, pure white merry-go-round to showcase his SS12 collection, taking Kate Moss for a saddle-side spin and prompting a thousand high street copycats of his broderie anglaise confections. Dreamy. Louis Vuitton collaborated with American artist Richard Prince in September 2007, brining his famous nurse paintings to life on the runway. Models wore sheer organza scrubs over their dip-dye corset dresses and touted a new collection of It-bags on which the artist himself had messed with the iconic monogram. Now this one was a biggie. 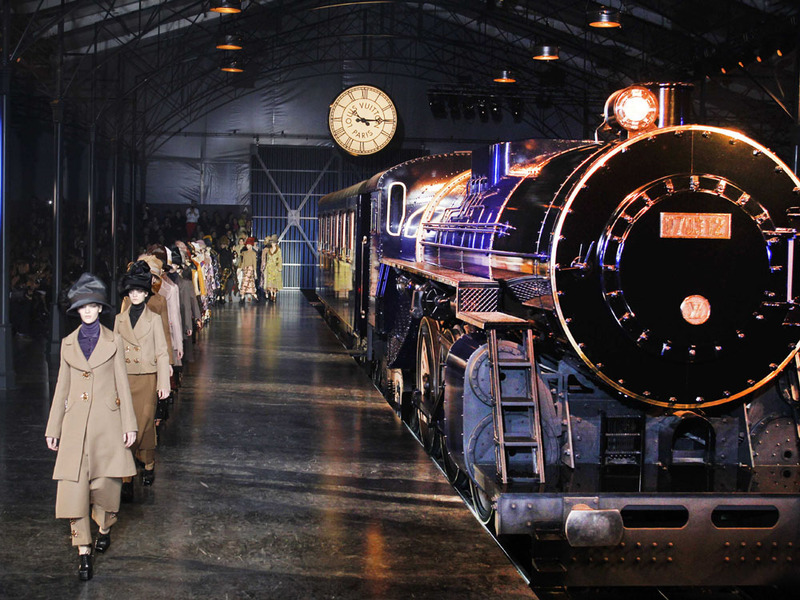 In 2012, an actual steam train pulled into Louis Vuitton’s faux show platform at the Louvre, coming complete with smartly dressed porters and an authentic station clock. Designer Marc Jacobs was harking back to the brand’s roots – each of his model passengers got off the train wearing enough retro style get-up to fill a vintage store and, of course, came carrying lots of luxurious luggage. New York designer Marc Jacobs was hired by Louis Vuitton in 1998 with a view to launch its first ready-to-wear collection. And launch it he did, roping in his fresh faced friends Naomi Campbell and Gisele Bündchen to model his utility-themed collection. It might look low-key but, trust us, in the midst of Nineties minimalism, Marc’s collection packed a punch. And for his next trick? Marc Jacobs decided that walking the runway was overrated and instead borrowed four escalators to transport his models, in pairs, towards the waiting photographers. Graphic, geometric prints became the must-have look of the summer and the designer put fancy flat shoes back on the fashion map too. Every look at Louis Vuitton’s AW09 show was finished off with a pair of chic silk rabbit ears. Madonna was the first to trial the trend in real life, wearing hers on the MET Gala red carpet, then later on billboards as the star of the label’s ad campaign. Marc Jacobs’ theatrics were a hard act to follow, but when new boy Nicolas took to the helm in September 2013, he knew exactly how to make his opening statement. Guests were invited into a dark tent, then, when the show was about to start, the designer simply opened the shutters to let the light flood in. Hello fresh start, hello new era! Kate Moss stole the show back in 2011 when she smoked a single Marlboro Light on the Louis Vuitton runway. Big deal, right? It might not have grabbed quite as many headlines if it hadn’t been the UK’s national No Smoking Day, too. Staying in became the new going out back in Autumn 2013 after Louis Vuitton presented the ultimate boudoir collection and put slip dresses firmly back on the fashion map. The runway was a hotel corridor boasting 50 rooms and, one by one, the models emerged from their doors to roam the halls in different states of dress and undress, like femme fatales from a Hitchcock movie. 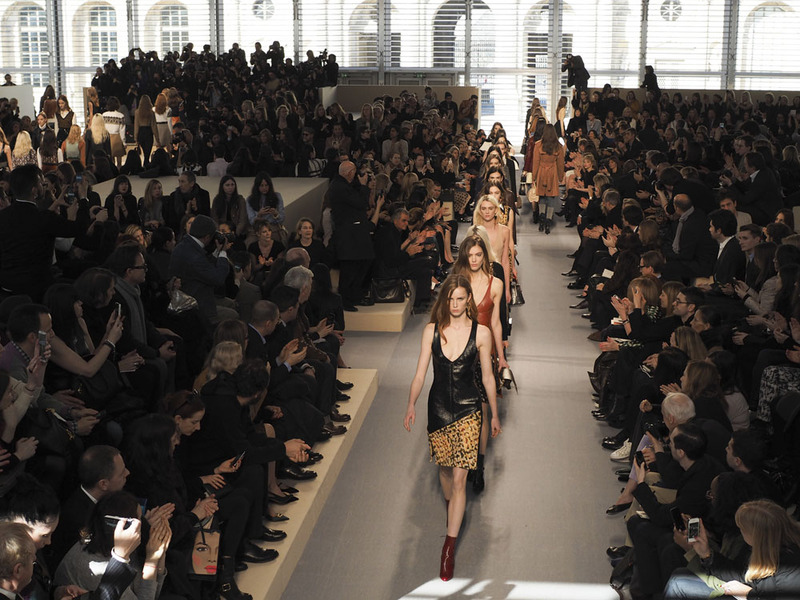 The fash pack gave a standing ovation when Marc Jacobs presented his last-ever collection for Louis Vuitton. The designer reworked props from his greatest hit sets, but this time the carousel, the escalators and the station clock all came coated in black lacquer. To finish, he gave us a finale of black feather headdresses, dedicated to ‘the showgirl in all of us.’ Now that’s what we call an exit.